Liddle's syndrome (pseudoaldosteronism, OMIM 177200) is a hereditary disease leading to early onset of hypertension. It is associated with hypokalemic alkalosis, reduced plasma rennin activity and low plasma aldosterone levels. This syndrome, even though it has an autosomal dominant transmission, It’s extremely rare, with fewer than 30 pedigrees or isolated cases having been reported worldwide as of 2008. Children are usually asymptomatic. The first indication of the syndrome often is the incidental finding of hypertension during a routine physical exam. The hypertension tipically appears in adolescence suggesting that several years are necessary for extracellular volume expansion. The adult’s presenting symptoms are usually related to hypokalemia(weakness, fatigue, mialgia, constipation or palpitations) and hypertension. Genetic test investigating gain-of-function mutations in the genes encoding the beta subunit of the epithelial sodium channel (ENaC). Liddle syndrome is due to gain-of-function mutations in the genes encoding the epithelial sodium channel (ENaC), involved in sodium reabsorption of the distal renal tubules. The epithelial Na+ channel (ENaC) is the rate limiting step for Na+ reabsorption across several epithelial tissues, including the colon, sweat glands, salivary ducts, airway and the distal kidney nephron. The final regulation of Na+ reabsorption by the kidney occurs in the distal convoluted tubules, connecting tubules and collecting ducts where regulatory inputs alter Na+ absorption through ENaC. 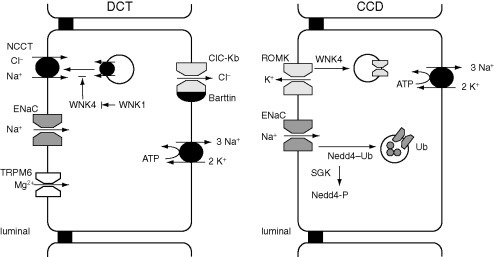 Sodium moves down an electrochemical gradient established by the activity of Na+/K+-ATPase located in the basolateral membranes of polarized epithelial cells. The movement of Na+ establishes an osmotic gradient that facilitates the movement of water in the same direction so that this process is one of the major determinant of extracellular fluid volume and consequently thought to be involved in the regulation of blood pressure. ENaC is composed of 3 homologous subunits α, β and γ, it is highly selective for Na+ over K+ and exhibits a relatively low conductance (~5pS) and slow gating kinetics with prolonged channel openings. The second way is nonfunctional in liddle syndrome. This way is based on ubiquitylation a process that usually regulates stability of target proteins,how does it work? It is carried out by the sequential activity of E1, E2 and E3 (ubiquitin ligase) enzymes that have an effect on proteins that are tagged with ubiquitin by the E3 ligases, in an ATP-dependent way, as showed in the figure below . Most of these proteins are degraded by the proteasome . Recent studies have demonstrated, however, that ubiquitylation of transmembrane proteins can tag them for endocytosis, often resulting in their degradation in the lysosome. This is usually reached by the presence of ubiquitin binding motifs or domains (e.g. UIM, UBA, CUE, GAT, UEV, VHS) within proteins such as epsin/Eps15, Hrs and GGA, which function to recognize the ubiquitylated transmembrane proteins and facilitate their endocytosis or sorting. In the kidney,the E3 ubiquitin ligase Nedd4-2 plays an important role,it catalyze the final step in the ubiquitylation cascade, in particular the attachment of ubiquitin onto lysine residues of the sodium channel. Nedd4-2 binds to ENaC located at the cell surface. This interaction occurs through binding of PY motifs located within the C termini of α-, β-, and γENaC to multiple WW domains in Nedd4-2. The ENaC specific endocytosis and recycling pathway is presented in this schematic diagram. Those proteins demonstrated to be involved in ENaC trafficking are depicted. ENaC internalization is initiated by the binding of Nedd4-2 to the intracellular amino-terminus (NH2) of each subunit and the addition of ubiquitin (Ub) moieties to the carboxy-tail (COOH) of the ENaC subunits. ENaC is then internalized by clathrin-dependant endocytosis through an interaction with epsin and passes through an early endosomal compartment (EEA1 positive). As reported in’’Role of the UPS in Liddle syndrome’’ review’’experiments performed in Xenopus oocytes or mammalian cultured cells that ectopically express ENaC, reveal that despite the ability of Nedd4-2 to induce removal of wild-type ENaC from the plasma membrane by ubiquitylation (likely linked to subsequent clathrin-mediated endocytosis), Liddle syndrome mutations in the PY motif of β or γ ENaC severely attenuate this removal, leading to increased retention of mutant ENaC at the cell surface and to elevated channel activity . Regulation of ENaC by Nedd4-2 and its impairment in Liddle syndrome. In Liddle syndrome, deletion/mutation of the PY motif in βENaC (or γENaC, not shown) impairs the ability of Nedd4-2 to bind (and thus ubiquitylate) ENaC, leading to accumulation of ENaC channels at the plasma membrane and increased channel activity. Together, this results in an aldosterone-indipendent increased Na+ and fluid reabsorption in the distal nephron, and increased blood volume and blood pressure, which are hallmarks of Liddle syndrome. The predisposing factors for the development of liddle syndrome are, according the actual knowledge, strictly genetic. We can observe the syndrome in presence of a mutations in the PY motif of β or γ in the locus SCNN1G SCNN1B. Liddle syndrome patients should be treated with the ENaC antagonist Amiloride and a low salt diet to stabilize their high blood pressure. This treatment improve patient’s prognosis whereas, without treatment, cardiovascular and renal complications usually occur.